Saturday started wet. 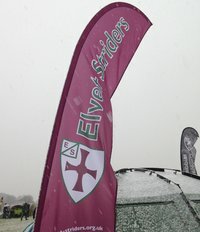 The rain then turned to sleet, the sleet turned to wet snow, the wet snow to ‘full on’ snow and by the time the senior men’s race started there was a two inch carpet of snow on the course. Thus the scene was set for this year’s North East X/C Champs at Sedgefield. Striders were there in reasonable strength and Sally Hughes was first out in the junior women’s race. Unable to hire a taxi from the tent to the start line she was escorted there by Mudpeople and her father. She looked a forlorn sight as she lined up with the other young athletes, most of who were shivering while others were shielded by umbrellas held by more devoted parents or club captains. The sound of the starter’s gun was almost drowned out by chattering teeth but off they went all eager to get going and get warm – or slightly less cold. 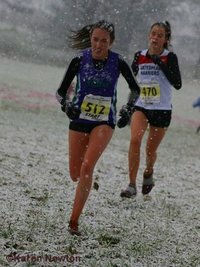 Sally held her own in the challenging conditions finishing in 28th place in a highly competitive field. Understandably, she made a hasty exit from the field seeking hot food and drink and a more substantial shelter than that offered by the Striders tent! As these races represent the North East Champs the senior men still get to start before the women and Striders were fielding a company of twelve of their finest brave men. As the young tend to know no fear Jack Lee went out at the front into the blizzard followed by two more senior comrades Neil Sleeman and Capt Evans. As some of you will know Neil hails from slightly warmer climes than Sedgefield in December but he took to the snow like a koala to a gum tree finishing second Strider home behind Jack and ahead of Capt E after an exciting tussle. Old Tom was next home holding off a challenge from the baseball hatted Aaron who was in turn followed in by James Garland making a welcome return to the fray. Innes must be benefiting from his own grass sessions as he had a good run as did newbies Alex W and Peter H, the latter supported by his understanding family. Shaun the Sheep’s trailer had been held up in the snow bound traffic so he came out of the pen some minutes behind the rest of the flock. Once other runners were nipping at his heals though he was soon trotting merrily along, although at the end, after braving the blizzard, it looked like he’d been ‘dipped’ if not sheared! 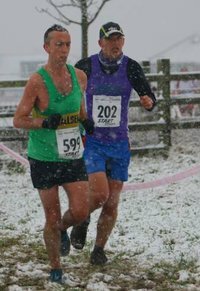 The two Mikes made up the team with Mr Bennett resembling a festive Santa speeding round the snowy fields and Mr Hughes covered in the white stuff and thinking Sally had had the best of the conditions. And, as it turned out, she had – so well done lads, a great performance – it’s what the club is all about: great days out and shared experiences in face of adversity! Well, if the men had to face adversity then the women were facing something even tougher! By now the snow was really meaning business not only covering the course in a thick blanket but also trying to bring down the Striders tent with a duvet size overlay. A field of over 220 snow women lined up for the start. Relieved to get under way Penny of the Antarctic skied off with the front runners followed by Elaine, Sarah and Mudwoman. Debs wasn’t far behind and the hangover she was suffering was soon “washed away like the snow in the rain” as she battled through the white stuff. There was no “compromising” either by any of the Striderettes today: Catherine Elliott made a determined effort to duck the snow flakes, Steph P was making a return to form as conditions become more to her liking, our debutant Fiona Wood smiling (or grimacing) in the knowledge that “things can only get better” and Rebecca serenely floating through the white mud dreaming of Mandalay. They all contributed to another great performance by the women’s team who, cheered on by Jan and many of the men’s team, finished in the top half of the table in a race where the first three finishers were all international runners and household names (they are in our household anyway). What a great day! Yes it was cold, wet and uncomfortable and the race was hard and tough but that’s what makes x/c so rewarding – the harder it is the more we enjoy that post race glass of wine or beer and the more we feel at one with our club mates. We can’t wait for the next time! I should thank Paul, really. The forecast for today’s orienteering event was terrible and my ribs were a bit sore from an embarrassing 0mph bicycle falling-over-in-slow-motion mishap from Tuesday, and the cat was lying on my feet and the bed was nice and warm, so no point going to Chopwell and getting cold and wet, was there? Except that I’d promised Paul I’d pick him up at 0930, and the handy thing about offering to give someone a lift is that it means you cannot easily extract yourself from the arrangement with any sort of dignity when your excuse is you’d rather stay at home and drink tea. The decision of my orienteering club to move the annual boxing day event from Durham back to Chopwell had not met with my approval and I fully expected to turn up and find a deserted swamp with people staying away rather than nip out to try their hand at a bit of orienteering. However a respectable 50 adventurers had turned out in the damp for a stomp around Chopwell so I was pleased to be proved wrong. Paul and I were so early we sat in the car for a while and drank tea and coffee and watched the world go by until we were almost late and had to dash over and register before the 11AM start. Paul was wearing some pretty pitiful looking Fell Shoes ‘just one more wear’ that looked like they weren’t brought by Santa yesterday. He completed his attire by not wearing a watch. That could be tricky in a score event. This wasn’t for any reason of principle – he’d just forgotten to bring one. I feigned sympathy and pretended to look for a spare while realising that he’d have a very difficult time planning any sort of meaningful route when he didn’t know the time of day. For shame. I might make this two victories in a row! The 11AM start was that rare thing in an orienteering event, a mass start, which tends to only happen in Score events. Not dissimilar to the start of the Durham Three Peaks. We scattered to all points of the compass and I decided to go for a gentle clockwise sweep of the map picking up as many controls as I could. Route choice was interesting and tricky. All controls had the same value so there were no ‘high-value items’ to be had on the peripheries. Scrabble players would have found it no fun. 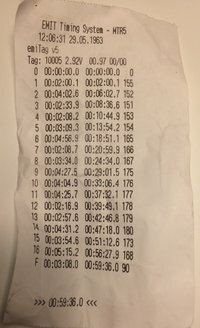 With each minute late incurring a 10 point penalty, and each control being worth 10 points, the common mistake is to go over time and get a penalty. It’s rare in a score event that getting just one more control is worth the risk of an associated time penalty. I nabbed 16 controls and got back with 24 seconds to spare, which I thought was pretty dandy. My route choice left a bit to be desired though, spending too much time chasing controls out on the periphery rather than mopping up easy ones close to the Finish. Camilla had struggled with the network of footpaths and the invariable confusion that arises when there are more footpaths on the ground than there are on the map. Judging when a trail is just a temporary trod or a permanent footpath is a difficult call, and it’s not every orienteering map that includes in its legend the rather ominous sounding powerline downhill bike track. Paul got back with -13 seconds to spare, which cost him 10 points. Pretty good considering he wasn’t wearing a watch, or the correct number of shoes. He’d started wearing two shoes. And he’d finished wearing two shoes. More or less. Mostly less. 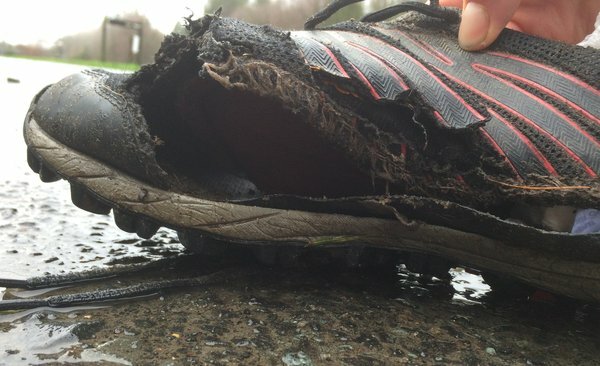 His right shoe hadn’t held up well, or at all, and was now a shoe of two halves. As Peter Cook might once have said, I had nothing against his right shoe. Unfortunately, neither did Paul. He’d attempted a mid-race pit-stop to change shoes but sadly I’d taken the car-keys into the woods with me rather than leaving them at registration so that was more time lost for Paul. Still, Every cloud. 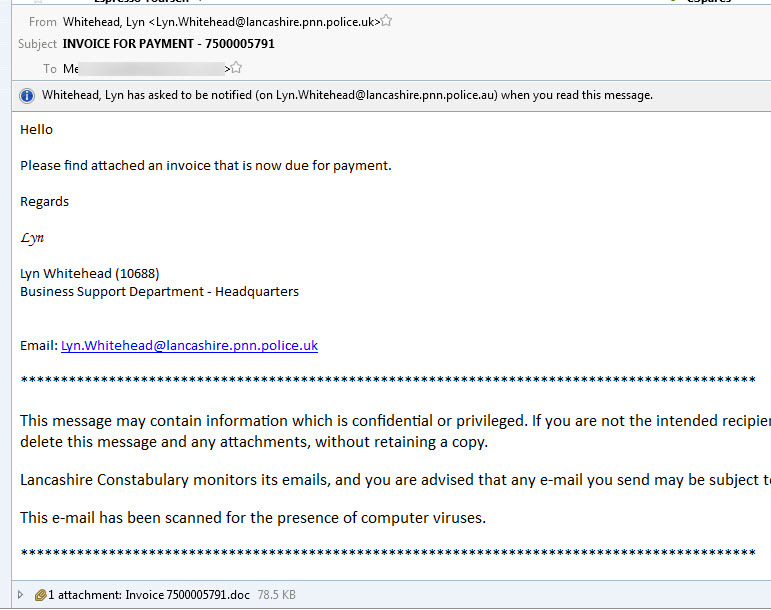 Never one not to see the bright side of another’s misfortune I realised that this meant I got another victory. Two in a row! Folder Gallery Error: Unable to find the directory wp-content/webcams/gardenpath/last60. Folder Gallery Error: Unable to find the directory wp-content/webcams/vivo7/test. 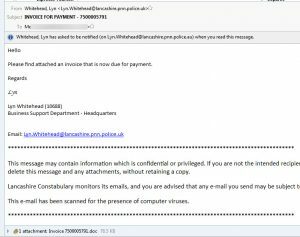 Another day, another slew of malware and spam. But I don’t recall one like this before. If you weren’t looking closely at the read receipt request you’d be forgiven for thinking it was the same as the (apparent) sender. But it’s actually an Australian domain. A good reason for not automating read (or delivery) notifications. What’s happened here is that I’ve had two poorly maintained blogs and I’ve crudely welded them together into one. This blog is now a messy tramsmash of www.bluecedar.org.uk and katsura.org.uk. Step 4. required installing a plug-in but that was no big deal. It’s a mess, but it’s a nice mess.